My girls LOVE jigsaw puzzles. Whenever Holly is getting a bit restless and over-excited, I always recommend a jigsaw puzzle to help her refocus. 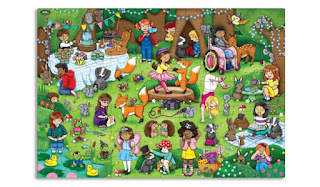 We own a lot of jigsaws but Orchard Toys puzzles always stand out as ones that are particularly child-friendly and puzzles that the girls will go back to time and again. 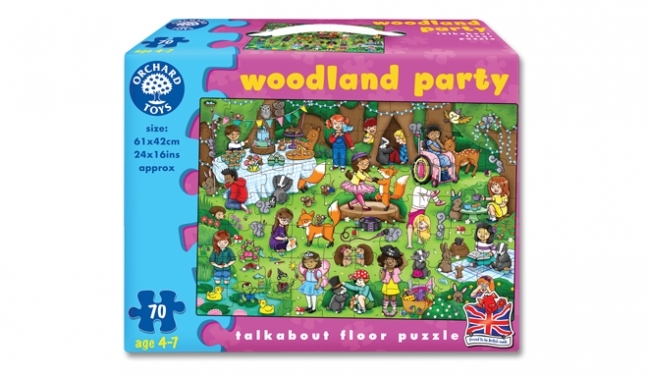 The Woodland Party puzzle is a new "talkabout" floor puzzle from Orchard Toys and Holly has very much enjoyed playing with it. The puzzle is suitable from about 3.5 years - about 6 or 7 years old. It has 70 pieces which makes it a challenge for Holly, but one that she is more than capable of applying herself to. I love seeing the concentration that she puts into puzzle-solving and it is so fascinating to see her little brain working overtime to try and find the right pieces. A talkabout puzzle is one specifically designed to promote discussion with your child. On the box you will find a few ideas of things you can talk about together but really the options are limitless. The picture that the puzzle builds is so packed full of activity that you always notice new things when you go back to it. 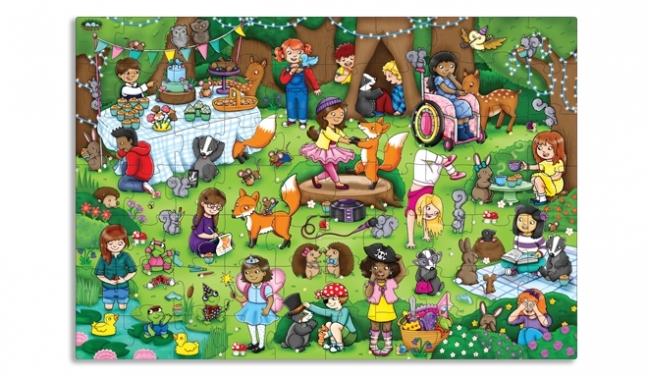 You might want to count the numbers of cupcakes, or try spotting as many different types of animals as you can. You might talk about why the squirrel is taking a photo of the badger on its smart phone, or wonder where the other squirrel managed to find so many coloured pencils. The jigsaw really is a big party full of activity. There are patterns and colours to match as well as animals and birds to help you work out where each piece goes. There are lots of different people of all colours, shapes and sizes and this really got Holly talking - I'm not totally sure she knew what a wheelchair was until we started talking about the picture in the puzzle so this was a great opportunity for us to talk. This is so much more than a jigsaw - its a chance to chat, a chance to test Holly's observation skills (spotting is one of her hobbies!) and a chance to think up crazy stories about what is going on in the picture. We love it! Of course, the jigsaw puzzle comes with nice chunky pieces which are easy to fit together and they all go into a handy carry box. 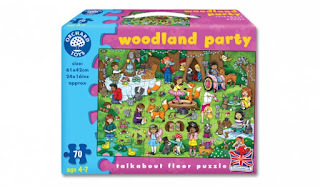 The woodland party puzzle from Orchard toys costs around £9.75.